Here we go, competitors: our two-hundred and forty-ninth challenge! Daij_Djan aka: THE johnny card. 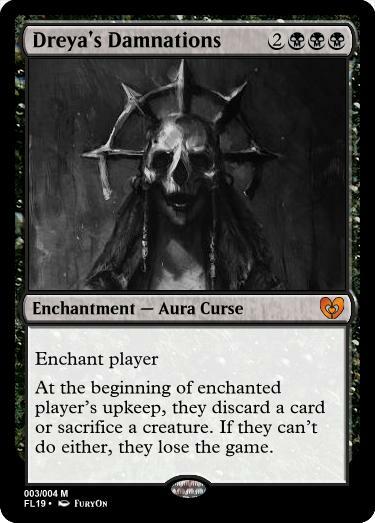 Here's a big dumb mythic that'll drive everyone at the table nuts. Hopefully your opponents will deck themselves before they can do anything crazy. 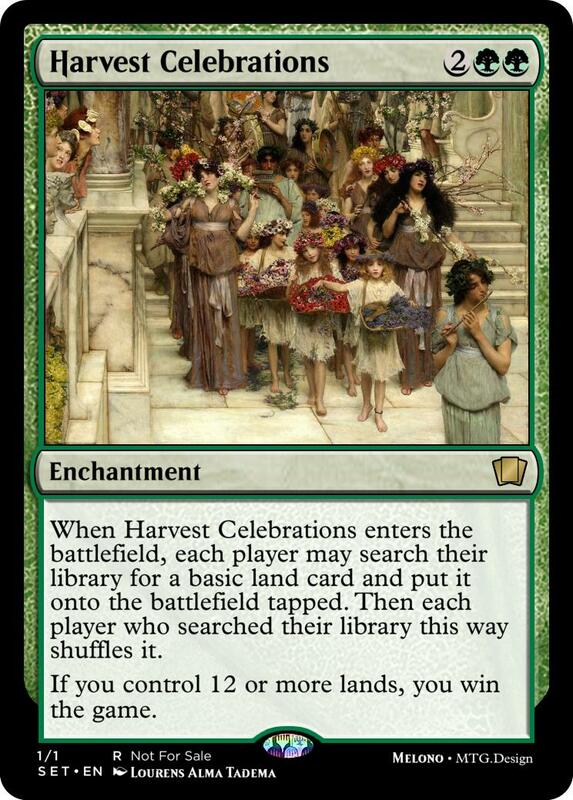 Each player draws cards equal to the number of cards in their library minus one. Wildly overwhelming, yet deeply calming. 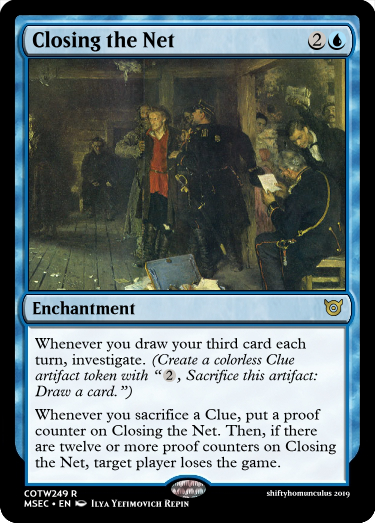 Whenever you sacrifice a Clue, put a proof counter on Closing the Net. Then, if there are ten or more proof counters on Closing the Net, target player loses the game. Hopefully I'm not stepping too closely on Mayael's Aria. 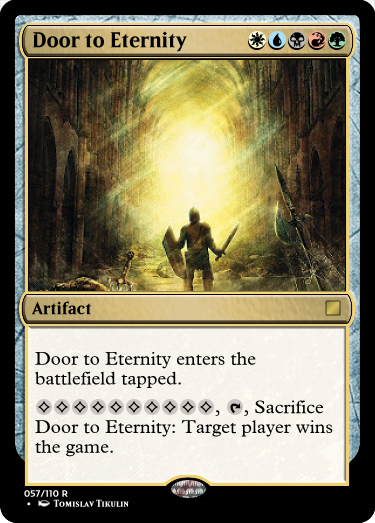 At the beginning of your end step, you may exile any number of artifact cards from your graveyard. If you do, you gain 1 life for each artifact card exiled this way. Then if the total converted mana cost of all artifact cards exiled with Recycling Plant is greater than 50, you win the game. I like that you can build it up slowly over time, or do it all at once. 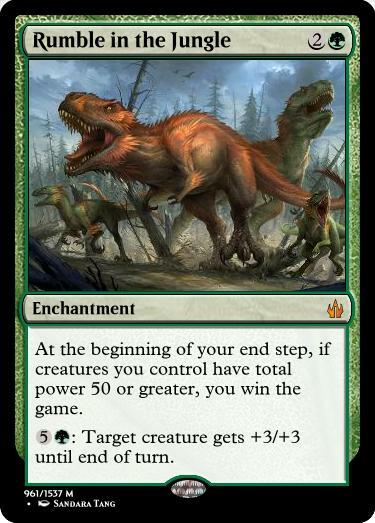 EDIT: I originally posted it for the clause to be 100, but realized that's just way too high, even if you had 10 cards with CMC 10, that's still 1/6 of the deck, which just isn't feasible. When you have ::50:: or more mana in your mana pool, you win the game. The worst part is that it can actually be playable. Here is a fun one! 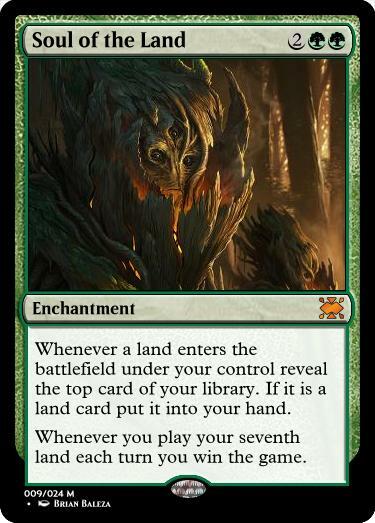 I — Each player exiles all creatures they control. 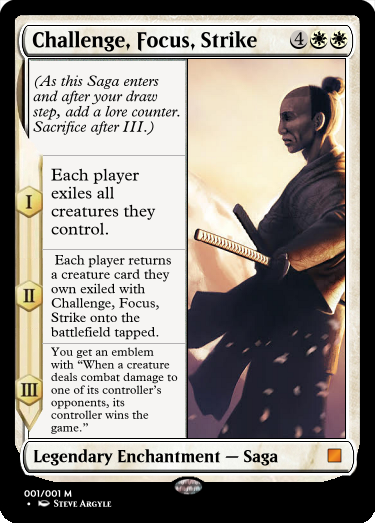 II — Each player returns a creature card they own exiled with ~ onto the battlefield tapped. III — You get an emblem with "When a creature deals combat damage to one of its controller's opponents, its controller wins the game." 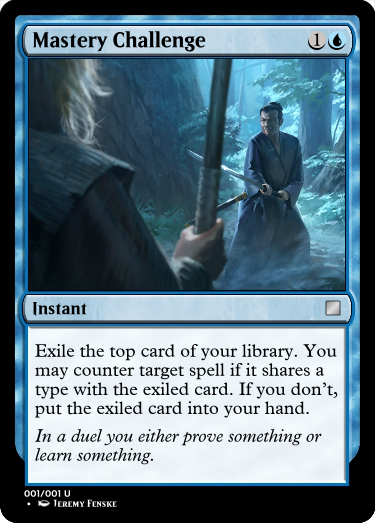 I wanted to try something other than a "you win the game" condition, and I thought a life-and-death one-stroke duel was a fitting representation. 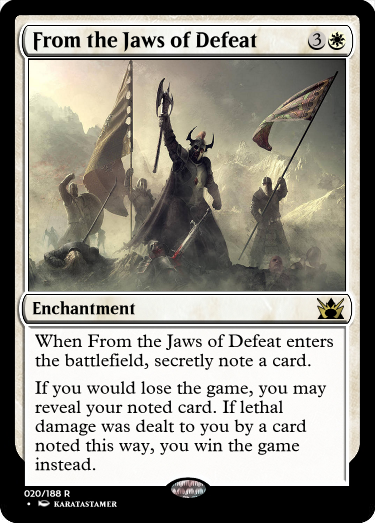 Of course, you can always get more creatures onto the battlefield while the "duel" is happening - nobody said Planeswalkers have to be honest and honorable. 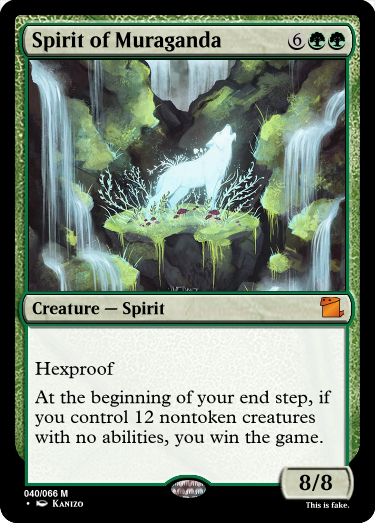 White mana because a lot of "exile all creatures" effects are white, and because the emblem (got a little cheeky there, adding an emblem to a Saga) is like a "fair" version of Vraska, Golgari Queen's emblem. Tesagk: I think your entry could use some trimming. Also, the lands and low life clauses are way way easier than the others. Mana ramp deck into this is all to easy. More like "Three Font Victory" am i right?! Sorry, not trying to be mean, but I totally misread the title at first. I mean, the next three posts rip into it, so whatever. I don't even get this much attention when I ask for help. Without meaning to be rude, you would probably get more of a response to your requests for help if you responded to critical commentary with a little less... disdain? I don't think any of us were "ripping into" your entry - I'm not sure viriss was even seriously critiquing it. 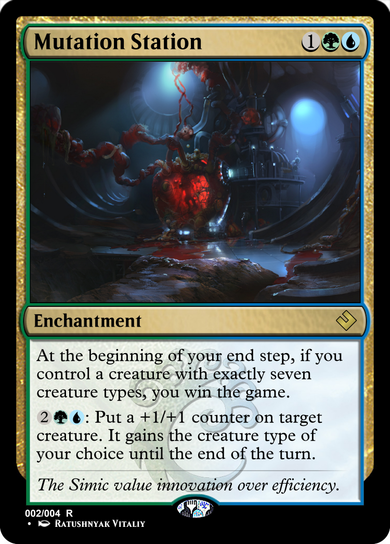 And I can't speak for spazlaz, but my aim was to point out "hey, this card is too wordy, cutting it down would probably improve it", and I find that visual representations of how text looks on a render are often the best way to judge whether a card's too much. You know full well that I receive the vast majority of criticism just fine. There's nothing more you can give? Are you sure? Tesagk : I think your entry could use some trimming. Tesagk: Speaking as the resident king of the small typefont, don't listen to those Frazzled Editors! You let your grand vision lead your design. Who cares if you make War and Peace or Bambi Meets Gotzilla? As long as you enjoy the process, it's fine, as sometimes these 2000 lightyear designs can inspire amazing Magic. Just look at the Un- sets. Buy, you have to be willing to be brave enough to own it. If it's not at all feasible, leave it there & move on, don't try to delete it. Remember, on the internet, nothing is ever truly deleted. 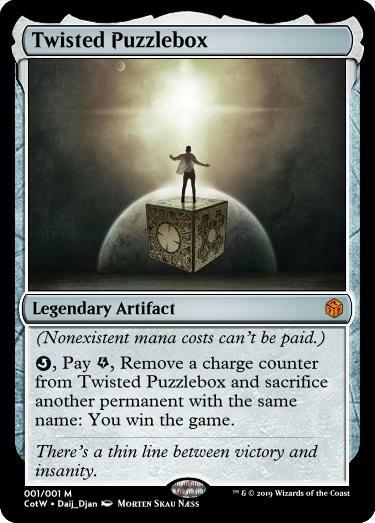 This post started out as a joke, but midway through, I paid the morph cost to turn it into a serious, hopefully inspirational soapbox. If you would gain life, you may put that many life counters on Exploited Vitality instead. 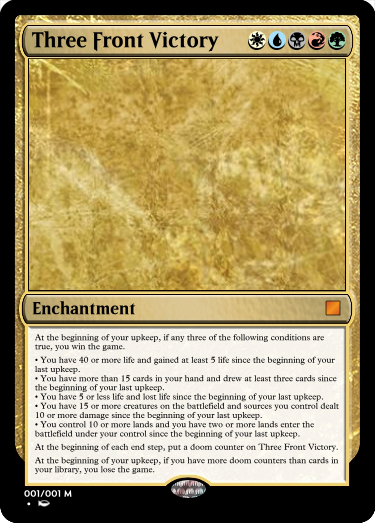 Remove twenty life counters from Exploited Vitality: Each opponent loses 20 life. 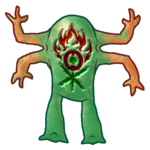 , Sacrifice a creature: You gain life equal to the sacrificed creature’s toughness. 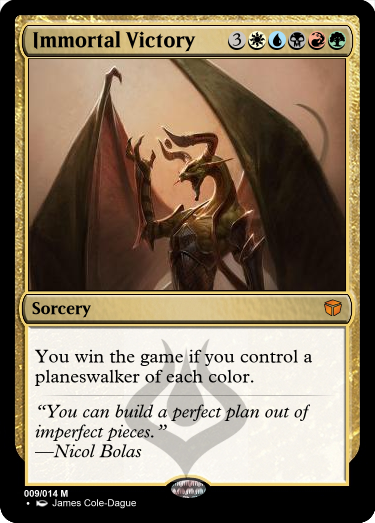 Tried to think outside the box with this one in the same way "One with Nothing" would. Tesagk : Speaking as the resident king of the small typefont, don't listen to those Frazzled Editors! You let your grand vision lead your design. Who cares if you make War and Peace or Bambi Meets Gotzilla? As long as you enjoy the process, it's fine, as sometimes these 2000 lightyear designs can inspire amazing Magic. Just look at the Un- sets. Why in the world would I keep it? I didn't delete it to hide it, I deleted it because it clearly wasn't worth it as an entry. Tesagk: See, this guy gets it.